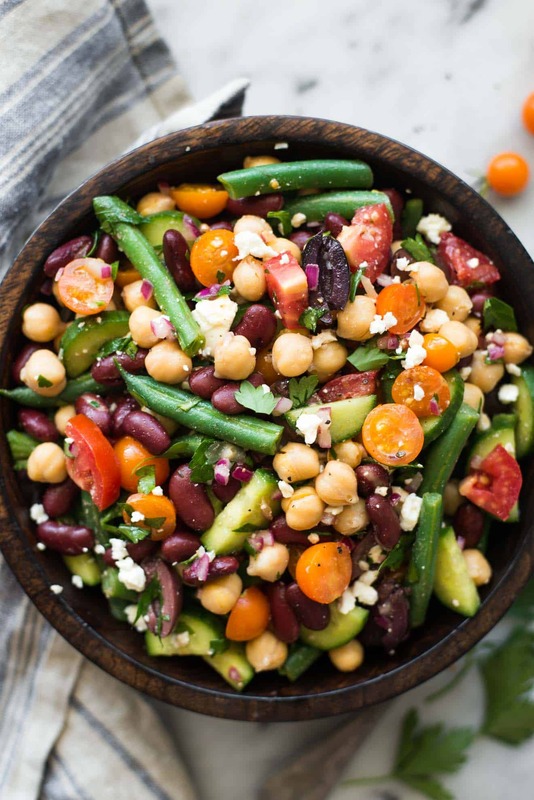 This healthy Mediterranean three bean salad recipe is packed with flavor, and it takes only 15 minutes to make! Perfect on its own or on top of toast! Friends, I’m about to enter the “scramble” mode. My summer trip to Europe is coming up in 2 weeks, and I am working around the clock to get things done before I go. If there was a way that I could clone myself to cook (and clean!!) all day, I would do it in a heartbeat. But I’d only want my mini me to be around for two weeks. Any longer would just be, I don’t know, creepy. Since I don’t have all the time in the world to cook, my mindset is on easy, get in and get out kind of meals. That’s where this Mediterranean three bean salad recipe comes in. 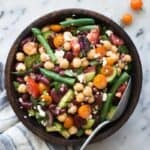 It’s essentially a bean salad packed with summer vegetables, feta, olives, and a light vinaigrette. Now that heirloom tomatoes are in season, I highly recommend buying a beefy one for this salad. The sweetness of those tomatoes balance well with the tang and saltiness of the salad. I would also use fresh green beans (or other waxy beans) instead of frozen ones. Frozen green beans just don’t get the same kind of crisp once you cook them. From start to finish, this salad takes only 15 minutes to make. Yes, 15 minutes! It’s definitely worth making on a weeknight. Giving the green beans an ice bath: Once you steam the green beans, throw them into an ice bath immediately. The ice bath is critical for keeping green beans lovely and crisp. The chill from the ice water stops the green beans from cooking further. I used to skip this step out of laziness, but once I started cooking my beans this way, I can’t go back to my old ways. The texture of the beans are so much better. Toss tomatoes last: Because diced tomatoes are quite delicate, I recommend tossing them last, after you’ve dressed the beans and other vegetables. 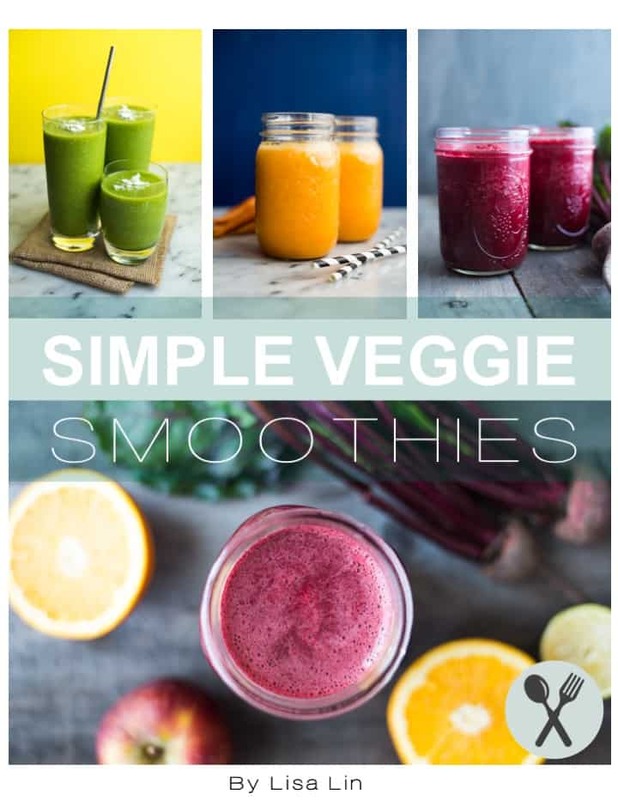 Variations: Feel free to add your favorite beans and summer vegetables to the mix! Cannellini beans, bell peppers, corn and zucchini are good additions. Serving options: This salad is great with grains on the side or with toast and a few slices of avocado! Use fresh green beans: I noticed that when I made this salad with green beans that weren’t fresh (they had been in my fridge for over a week), their color didn’t look good the next day. Try using beans that you have bought from the grocery store no more than a few days ahead. Rinse green beans and steam for 2 to 3 minutes. While beans are cooking, add 1 1/2 cups of ice into a bowl and add water. Once green beans are cooked, submerge beans in the water to stop the cooking process. Let it sit for 5 minutes. Mix all the dressing ingredients in a small bowl and set aside while you prep the rest of the salad. Soaking the onions and garlic in a vinegary solution helps take some of the raw bite away. 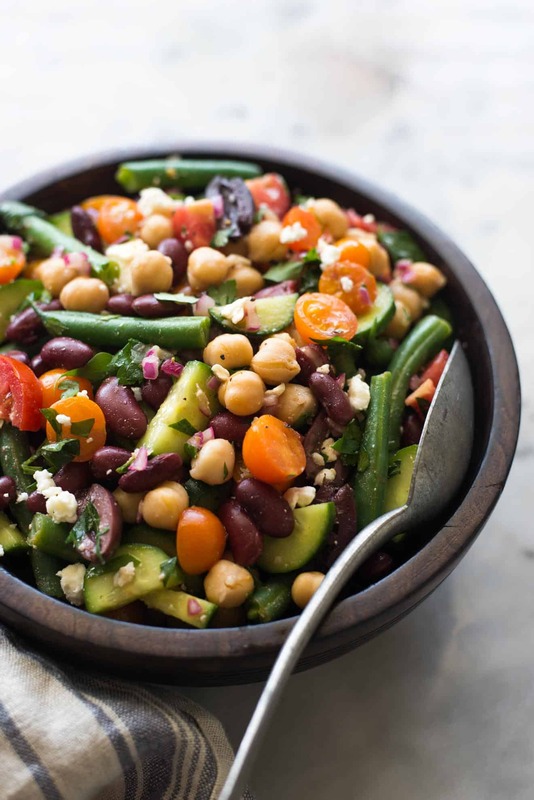 In a large bowl, add the green beans, chickpeas, red kidney beans, cucumber, parsley, feta and olives. Pour vinaigrette and toss to coat the vegetables. Add diced tomatoes and toss again. Season with salt and pepper, if you like. Serve on its own, with a bowl of grains or on top of toast! Refrigerate leftovers for up to 2 days. If you leave the salad in the fridge for any longer, the green beans will start turn brown. Thank you, Sonali!! Hopefully, I’ll have some good photos to share! The whole family loved this salad, it was quick and easy to throw together, I served it with BBQ butterflied lamb. Delicious ! 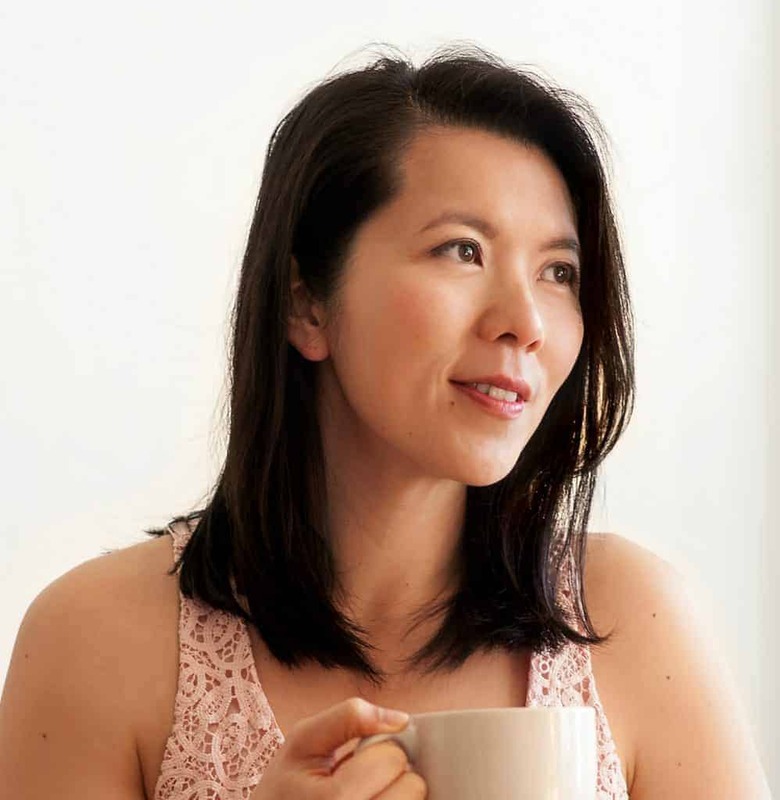 Ellie, thank you so much for trying out the recipe! I’m so glad that your family enjoyed it! I should try it with grilled lamb next time. Hooray for Europe! Booo for more dishes! Augh.. I find myself complaining more and more about dishes, Lisa. Can I just hire someone? 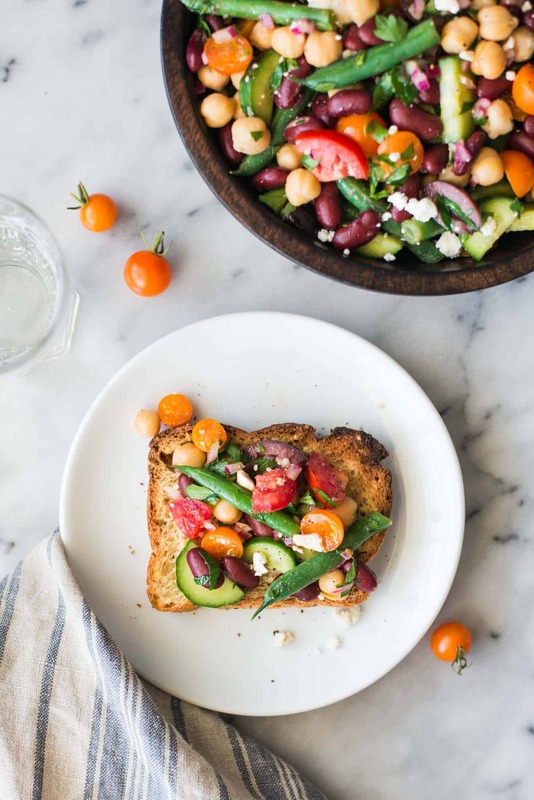 This bean salad is sooo fabulous.. packed with texture; sweet juicy tomatoes, crisp beans, creamy feta.. oh my ! I know I’ll love this one!